The enrolment of the first students to attend the American University of Malta is proving to be a challenge, according to its provost, John Ryder. “Obviously, being a new university with no track record is proving to be challenging. However, we are very optimistic we will be offering a first-class university that will be among the best in the Mediterranean,” he said. Although the AUM will open its doors to students within days, Prof. Ryder would not give an indication of the number expected to join the four degree courses being offered. “We are still in the process of recruitment, and I am not going to talk about student numbers and their profile before the admission period is over in two weeks’ time,” he said. Until a few days ago when the interview with Prof. Ryder was conducted, information reaching Times of Malta indicated that the number of students applying to follow a €15,000-a-year degree programme at the AUM was still on “the low side”. Prof. Ryder said the student body was expected to consist of expatriates residing in Malta and others coming from European states, the Middle East and the US. 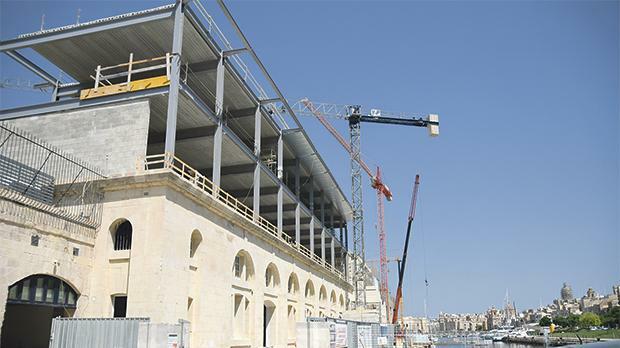 Although the campus at Dock 1 in Cospicua – the first of two – is expected to start hosting students as of Monday, a lot of work is still in progress. Prof. Ryder dismissed any suggestions that the building itself was not on track, saying he was sure the lecture rooms would be certified by the National Commission for Higher Education as stipulated by the licence. The AUM has made significant progress in terms of academic preparations. Sixteen lecturers, all PhD graduates and almost all from the US, have been recruited on a full-time basis. The university will be offering three bachelor’s degrees – in game development (IT), business administration and accounting – and a master’s degree in business administration. The plans are to increase the number of courses to 25 in the coming five years, when it expects to occupy all the space available at its Cospicua campus. When the project was first announced in 2015, the AUM planned to start courses in September 2016. However, it did not manage to obtain the licence on time and postponed the opening by a year. The project has been troubled by controversy, particularly after the government decided to allocate a prime site of ODZ land to build a 90,000-square-metre campus at Żonqor Point. As opposition mounted, the government and the investors agreed to redraft the plans, splitting the university in two campuses – Cospicua and Żonqor. The footprint of the campus at Żonqor, in Marsascala, will be drastically reduced compared to the original plans. Asked whether the AUM was still insisting on a campus at Żonqor, Prof. Ryder confirmed and said the site would host a fully fledged university. The Sadeen Group from Jordan owns the AUM. The company has 30 years of experience in construction, but the AUM is their first investment in the tertiary education sector.